> Marketo > Learn how to fill your funnel with high-quality leads! 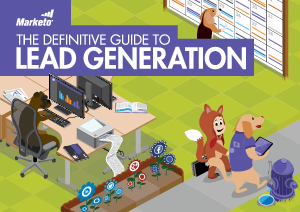 In this comprehensive, 160 page guide, we cover topics ranging from content marketing and website SEO to telesales and content syndication — all through the lens of lead generation. Packed full of checklists, charts, and thought leadership from the leading experts in marketing today, The Definitive Guide to Lead Generation will teach you how to collect information from prospects across every channel, and deliver the highest quality leads to your sales team.